I asked Micheal, (one of my best friends) who started his own garden design business a few years ago, if he wanted some Agrostemma ‘Ocean Pearl’. He did, so I planted three more six-cell packs outside. I then got zealous (is that the right word?) 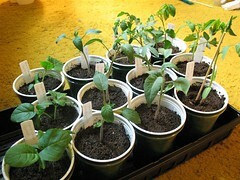 and even though it was late, decided to transplant the Tomato and some Eggplant seedlings into larger drinking cups. OMG!!! That took a while… It was really really late, and I was only about half way done, so I decided to do the rest next next day. Oh yeah… I found a mutant Tomato Seedling. 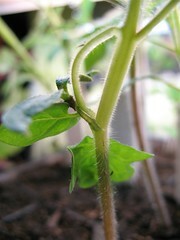 2. had another seedling fuse right into the stem, pinning one of its leaves. I started hardening off the Tomatoes and Eggplant seedlings I transplanted yesterday by taking it outside when I left for work, then bringing them in when I got home. Michael emailed me asking if I can also plant some Bells of Ireland, so I passed by Target after work and bought some seeds. 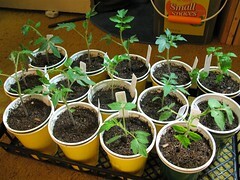 I transplanted the rest of the Tomatoes into more drinking cups. I have so much!!! I think I have about 26 individual plants in drinking cups. 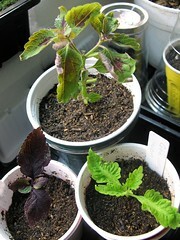 I also performed surgery on three dying Coleus (Velvet Lime, Amazon and Dark Star Hybrid) that I mentioned yesterday. I really hope they survive!!! This entry was posted in Uncategorized and tagged coleus, coleus amazon, coleus dark star, coleus velvet lime, eggplant, pepper, sow, tomato. Bookmark the permalink.